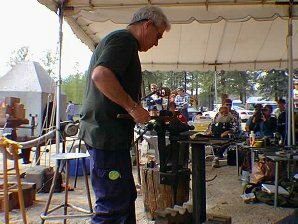 The Northwest Blacksmith Association held the Spring, 1999, conference in Winthrop, Washington from Friday, April 30 through Sunday, May 2. Featured demonstrator was Uri Hofi, assisted by his striker, Amit Har-Lev. The demonstration started at about 1:00 on Friday. The affable Israeli smith mentioned that he'd never done 16 hours of straight demonstrations before, but had prepared a lot of material. Then, launching into a series of demonstrations, talks, stories, and philosophical expositions proceeded to astound the crowd of nearly 300 Northwest smiths with an amazing amount of information. By noon on Sunday, he had shown more than 28 demonstrations and projects, ranging from drawing a point on a bar (his way!) to sculpting a female torso. Along the way, we were treated to a number of stories and observations that ranged from witty observations of cultural differences to discussions of repetitive motion disorder, and how to smith without damaging ourselves beyond repair. In addition, Uri described the origin and demonstrated the elements of his system of blacksmithing. He explained the nature of, design of, and philosophy behind his famed hammers, hammer use, and approach toward life. Starting with two decorative elements (acanthus scroll ends) he explained how they were rooted in more than 3000 years of decorative history, and proceeded to move metal with a vengeance. 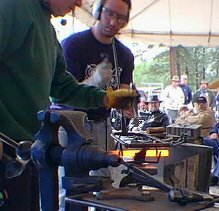 Uri described many different cultural traditions that apply in blacksmithing, ranging from hammer and anvil design to the code used between the master smith and his striker. Reinforcing the lesson, he and Amit produced wonders between hammer and anvil. To Amit fell the task of heating the metal, finding and arranging the master's tools, and applying precisely measured force in the position and direction needed by Uri. The crowd was amazed to learn that Amit, a 27-year old Israeli native, had been smithing for only 6 months with three additional weeks training as Uri's striker. But, as Uri emphasized, he was a very unusual young man with a great future ahead of him. Amit mentioned how greatly honored he felt in being able to work with Uri, and how a close rapport was necessary in order to strike with someone else. Then, several strikes on the anvil, a short rhythmic cadence, and the strike, STRIKE, strike, STRIKE, ding, DING, strike, STRIKE of the hammers began again. Following Uri's blows, Amit placed his blows in the same place, at the same angle, and on the same line Uri landed his hammer blows. Maintaining the rhythm by striking on the anvil rather than the work, Uri would use one or two hits to inspect or reposition the work before continuing on. Signaling that the striking sequence was over by dragging his hammer across the anvil, he might strike one or two adjustment blows before handing the piece back to Amit for re-heating.